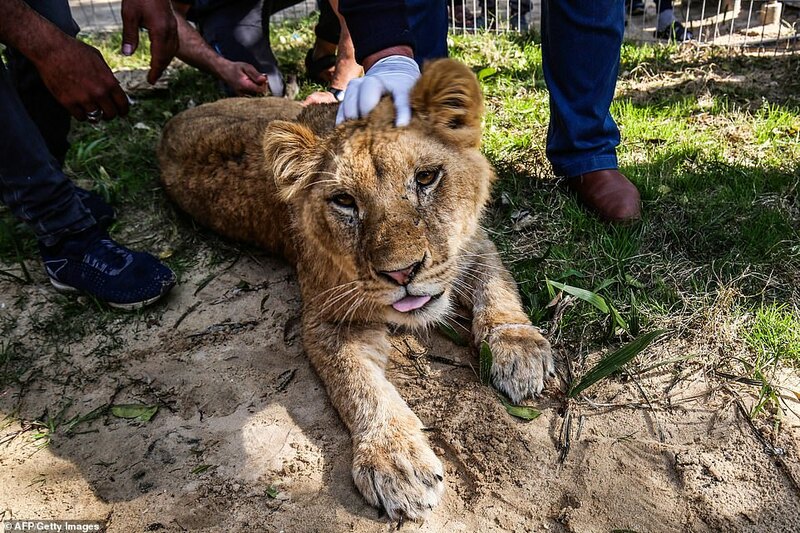 A lion has been declawed by a Palestinian zoo so visitors can ‘play’ with the maimed animal, sparking outrage from animal welfare campaigners. 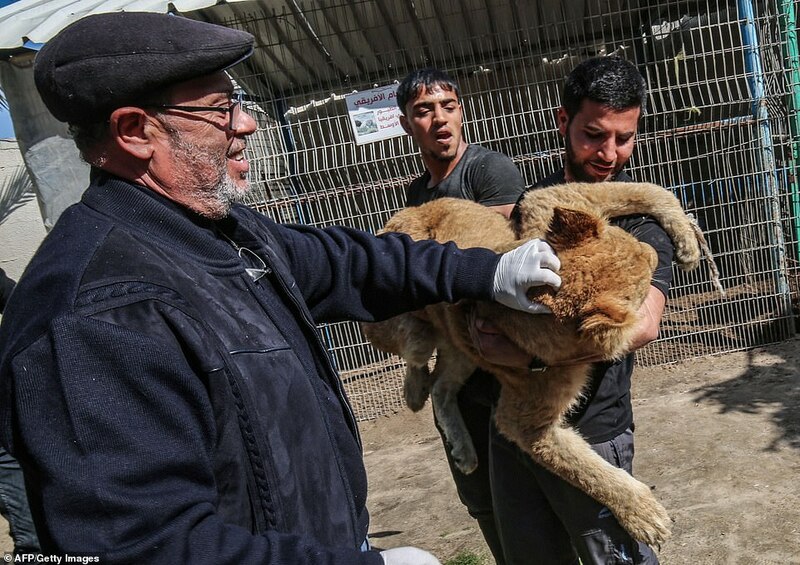 The 14-month old lioness, called Falestine, was manhandled by zoo keepers at the Rafah zoo in the Gaza strip who pushed her onto the ground and put a shroud over her head as a vet clipped off her claws with a pair of shears. 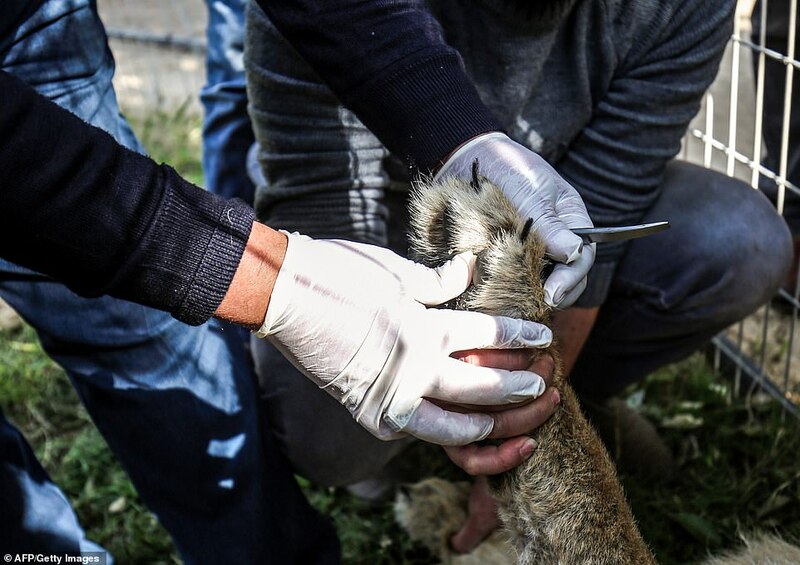 Falestine was tranquillised and placed on a table two weeks ago while the vet sewed up a horrific wound from her paw which oozed blood, before the claws were clipped down further on Tuesday. 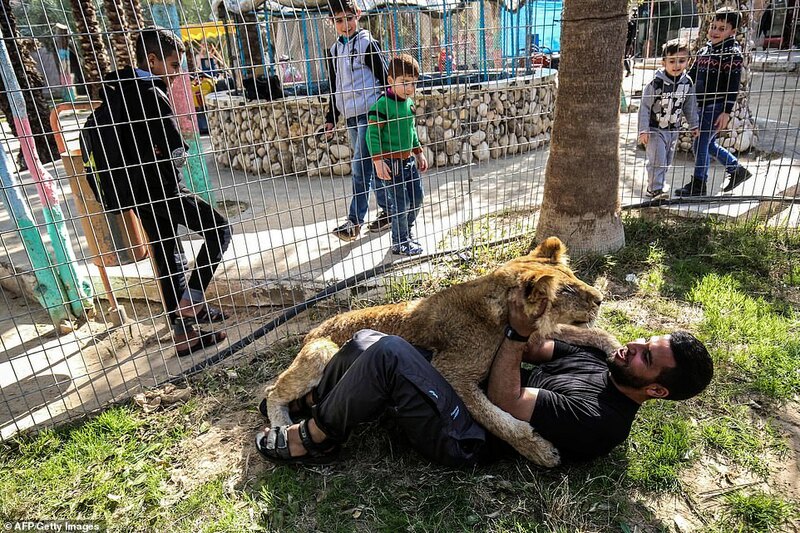 The zoo in the war-battered Palestinian enclave is promoting itself as offering the chance to play with the lion, who has been declawed but still has a full set of teeth. The lioness is supposed to be placid enough to meet visitors, despite animal rights campaigners saying human beings have subjected her to horrific pain. 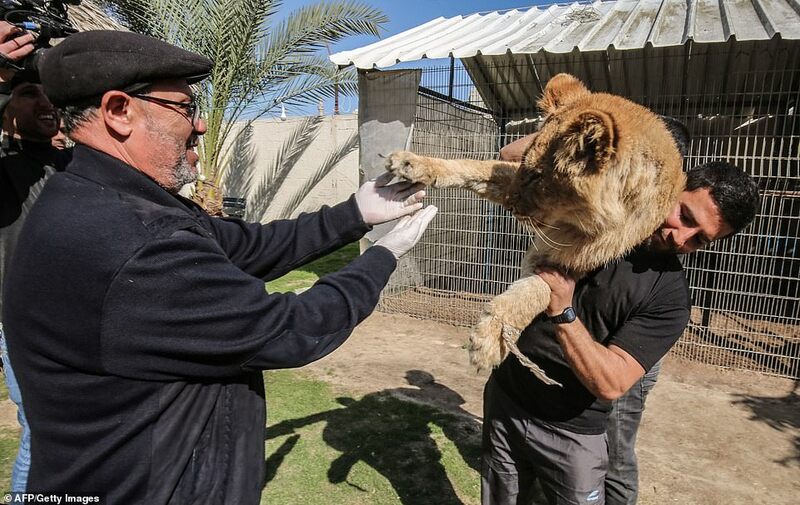 ‘I’m trying to reduce the aggression of the lioness so it can be friendly with visitors,’ said Mohammed Jumaa, 53, the park’s owner. 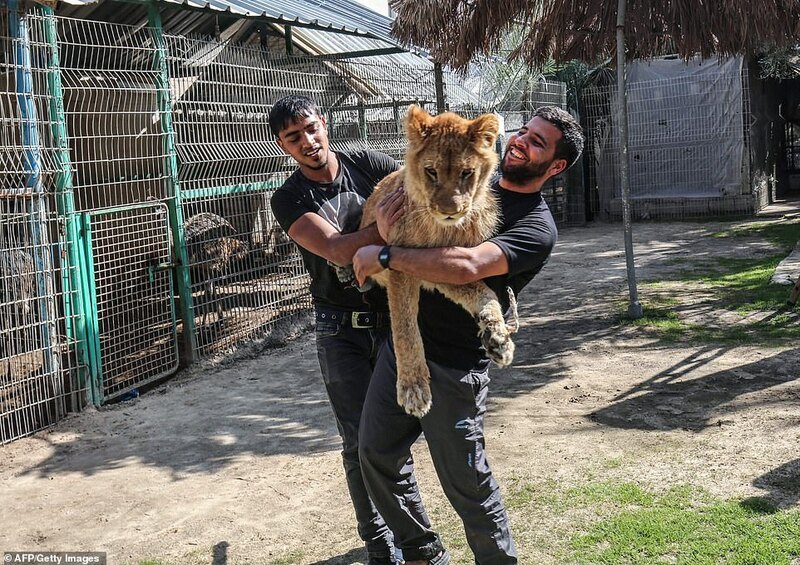 It is the latest unconventional animal care practice in Gaza, where a few dilapidated zoos compete for business. 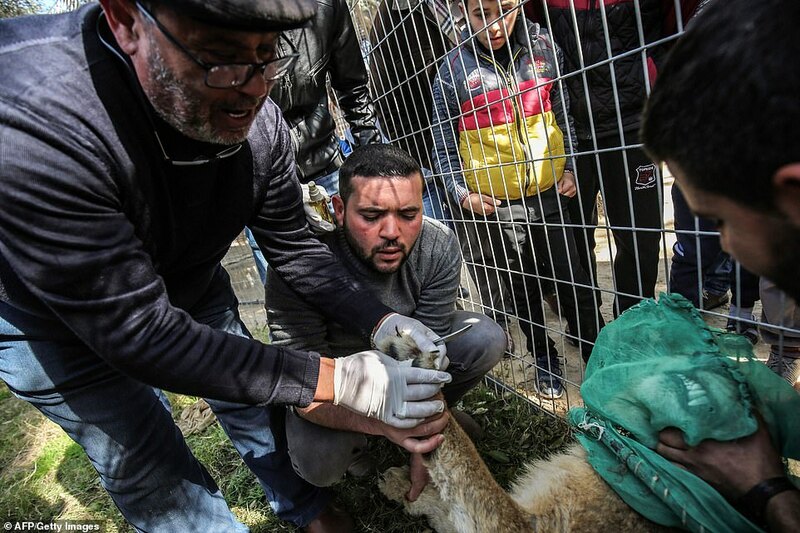 Fayez al-Haddad, the veterinarian who operated on Falestine two weeks ago, watched her behaviour closely on Tuesday as she was briefly taken out of her cage to be near local residents, including children. 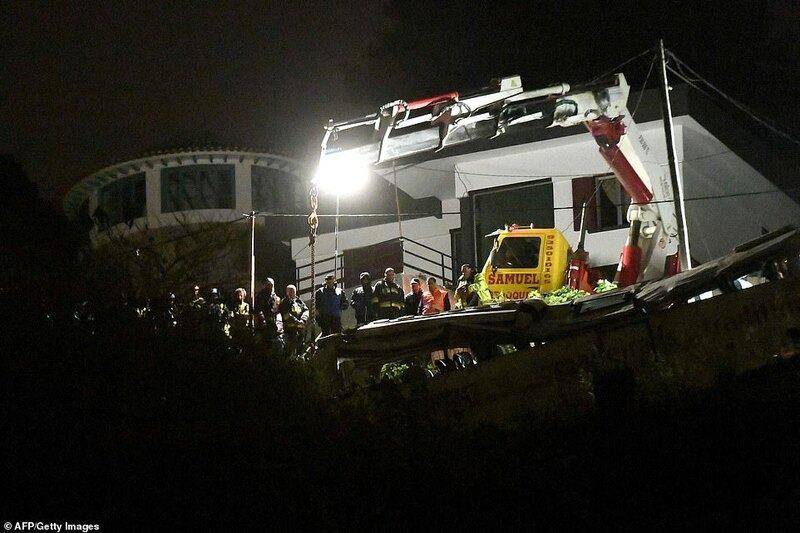 ‘The claws were cut so that they would not grow fast and visitors and children could play with her,’ Haddad said. 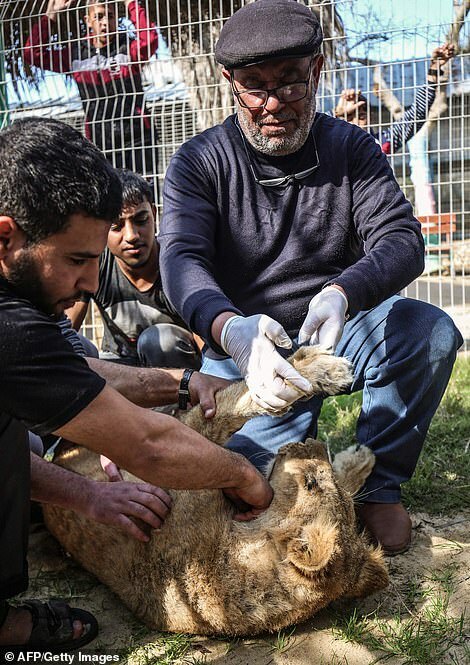 There is no specialised animal hospital in Gaza so the operation was carried out at the zoo, which is filthy and lacks the proper facilities. The vet denied that it was cruel to the animal. ‘We want to bring smiles and happiness to children, while increasing the number of visitors to the park, which suffers from high expenses. ‘(The lioness) does not lose its innate nature.’ He claimed. 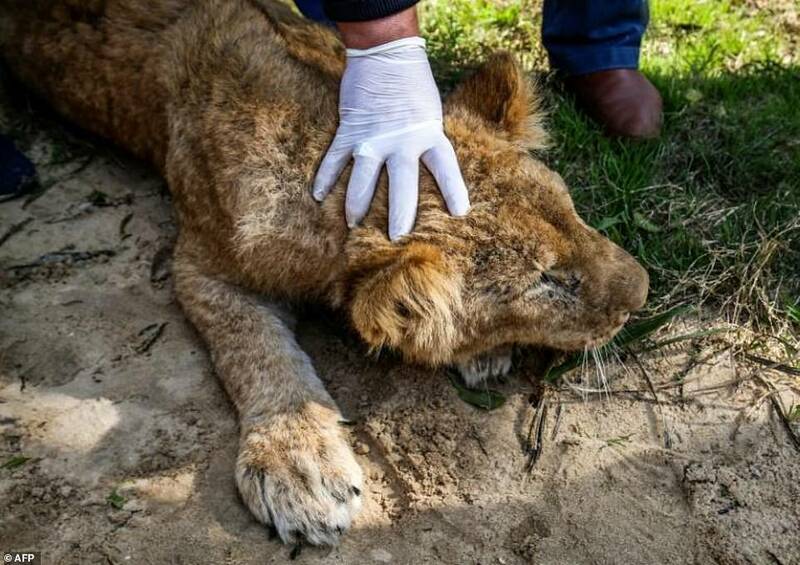 But the Four Paws charity say the procedure is horrific and agonising for the lion. Four Paws say: ‘For big cats, removing the claws is a particularly vicious procedure which causes long-lasting damage. They explained that removing a lion’s claws is the equivalent to amputating the fingers of a human up to the knuckle and without them the lion loses vital functions and dexterity. The charity added that the zoo keeps around 50 animals in deplorable conditions and should be closed – four newborn lions recently froze to death there. 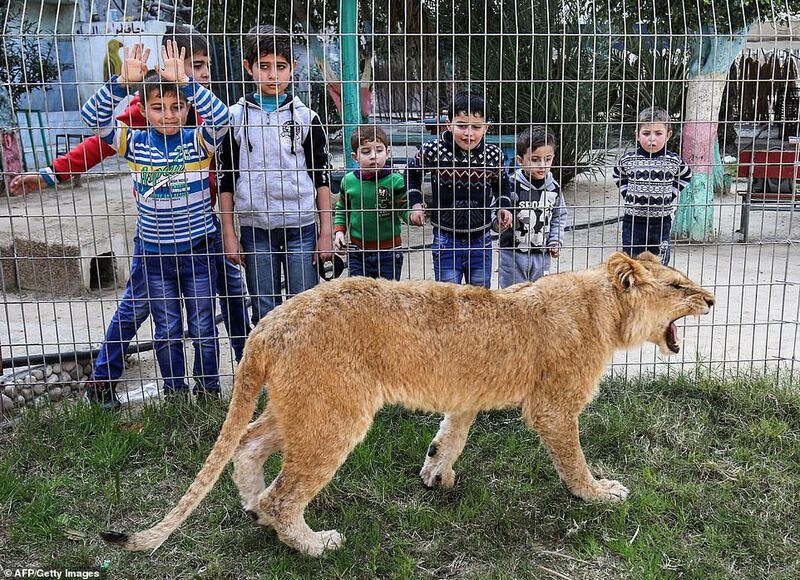 The small zoo in Rafah was opened in 1999 and is in the southernmost part of the Gaza Strip, close to the border with Egypt. 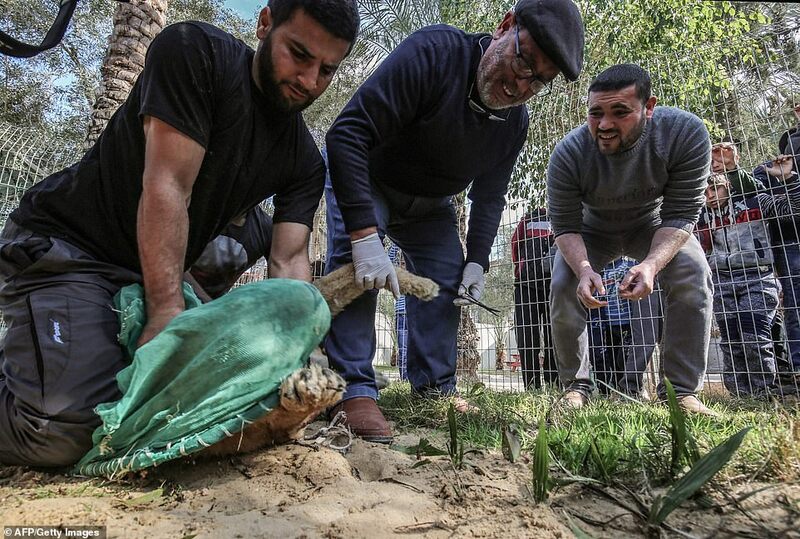 From there, wild animals are repeatedly smuggled through underground tunnels to and from Gaza. 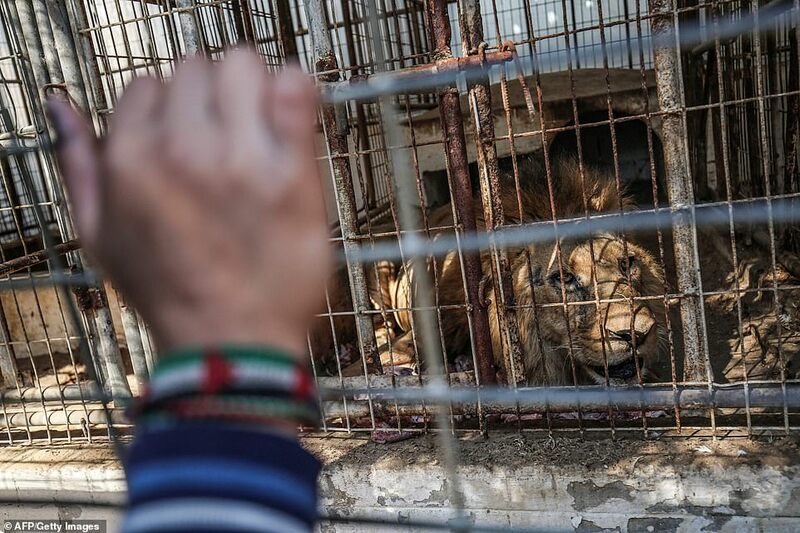 Currently, 49 animals – including five lions, a hyena, several monkeys, wolves, emus, cats, dogs and exotic birds – live in tiny and desolate cages there. Since the opening of the zoo, many animals have already died due to rocket attacks and war battles. It was destroyed during an Israeli army bulldozing operation in Rafah in 2004, before Jumaa re-established it two years ago. 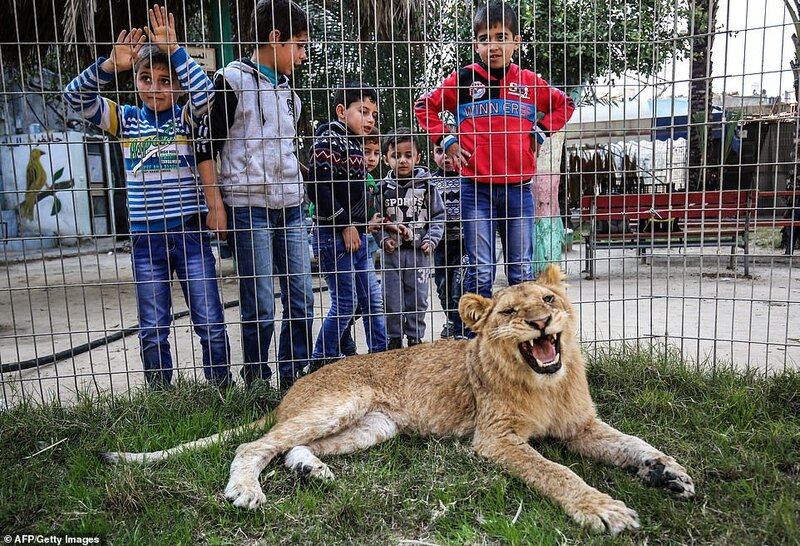 A group of laughing children were watching from the other side of a low fence as Falestine was briefly shown out of her cage Tuesday for the first time since her operation. She interacted and played with zoo keepers, though for now guests were kept slightly apart. At times the lioness looked stressed, trying to scratch its nonexistent claws on a tree. Twelve-year-old Anas Abdel Raheem insisted he wasn’t scared as he leaned on the fence. 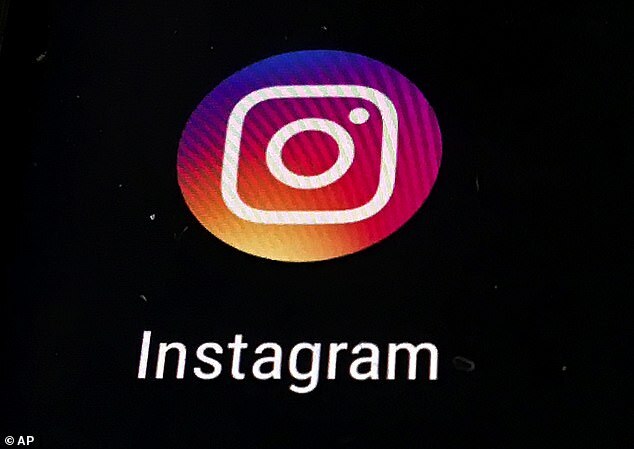 ‘I am happy because I played with the lion and it did not bite me or tear my clothes,’ he said. Gaza is home to two million Palestinians but has been blockaded by Israel for more than a decade. 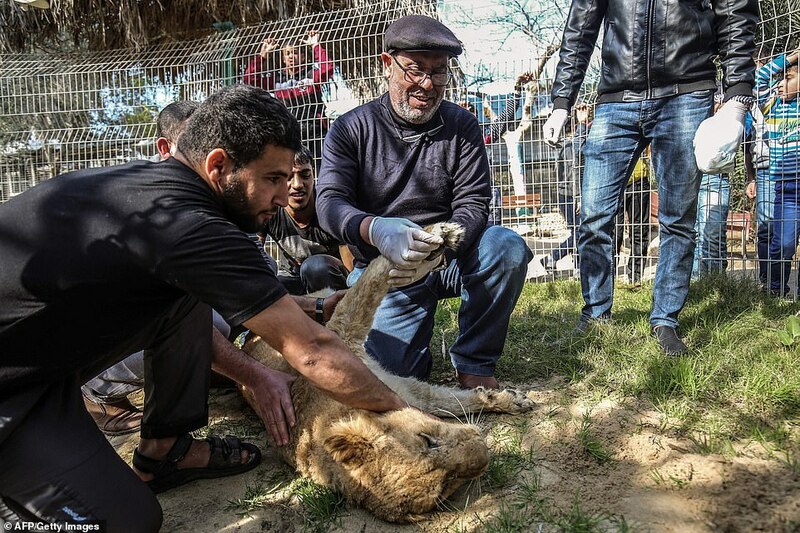 In 2016, the last animals were evacuated from what had been dubbed ‘the world’s worst’ zoo, also in southern Gaza.